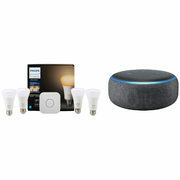 Keep it lit with this bundle deal from Best Buy, because you can get a Philips Hue A19 White Ambiance Smart Bulb Starter Kit and a third-generation Amazon Echo Dot for $119.99 (regularly $239.99) with free shipping, for a total savings of $120.00! For reference, the standalone Philips Hue White Ambiance Starter Kit is currently on sale for $119.99 at Best Buy, which means you'll get an Amazon Echo Dot for free with this bundle! This offer is effective online and in Best Buy stores (where available) until April 21. BestBuy.ca offers free shipping with orders over $35.00 (excluding oversized items) and a free in-store pick-up option with no minimum order. No comment about pricing ? Not bad. If you sell the Dot, and Bridge for $25 each, you're only paying $18.50 per bulb. Thanks. As I said, it's my first smart light kit and haven't being watching deals about these products. I was more interested in the color kit but white bulbs will do just fine to start with. First time buyer for a Philips Smart Bulb Starter Kit A19 (White). To be honest, I'm not sure it's the best deal around but taught that by sharing some of you could comment. The starter kit comes with 4 bulbs (white ambiance), the bridge and also includes an Amazon Echo Dot (3rd Gen). Obviously if you want these bulbs, this is a good price. IMO, the colour ones are very overpriced, but the white ones are insanely overpriced, so to ME, this brings them somewhere near what they're actually worth. You can get $25 for the bridge without a doubt, and ~$50 for the Dot (probably dependent on where you live). At that point, the bulbs are ~$15, which isn't too bad. Thanks for the info ChubChub. Haven't taught about it but it might be a good idea to sell the Dot. Just not sure yet if I will or not have a use for it. Need to explore & learn what else it can do. What is the main difference between these bulbs and the more round ones? Is it only the ability to dim the lights? And i see for the hue bridge sold separately it says 2.0, and i am guessing this comes with version 1 so what is the difference between them? This starter kit comes with a 2nd gen bridge. Seems like a pretty good deal to me. I just ordered two. Planning to keep one bundle and will try and sell the echo and bridge from the second. Ignorant question here -- why would someone buy the bridge via Kijiji/Craigslist? Wouldn't most people have just bought a starter kit and already have a bridge? Are there multiple bridge use cases? are the bulbs 3rd gen? Or does that even matter for non-colour bulbs? I never lose power, but I sometimes lose my internet connection for half a second. Would these lights turn off in that case? And would I need to do some tinkering to get it to reconnect? No. They would stay on and no, they would keep working. I was tempted at $120 for just the starter kit. In for 2 with the echo dots included. Thanks OP. There's a limit to how many bulbs you can have per bridge. It's only for people who have fully invested in hue and have bulbs everywhere. Also useful for range issues for bigger houses. They remember the last setting they were set to, so they would stay on at your desired colour/temp. If you unplug the lamp they are connected to physically from the wall and replug, they will go back to default 100% brightness white until reconfigured in the app. Received the kit. Setting up wasn't that bad but didn't realize the bridge needed to be connected permanently ethernet cable/router. My router is Bell Fibe with 4 LAN. Since I'm not using the Xbox often, I will configure the Xbox using WiFi. If someone with Bell Fibe router needs more LAN, how can it be done ? Also installed Echo Dot. Quite impressive, it does capture voice commands from another room while TV is playing. Voice recognition has greatly improved !